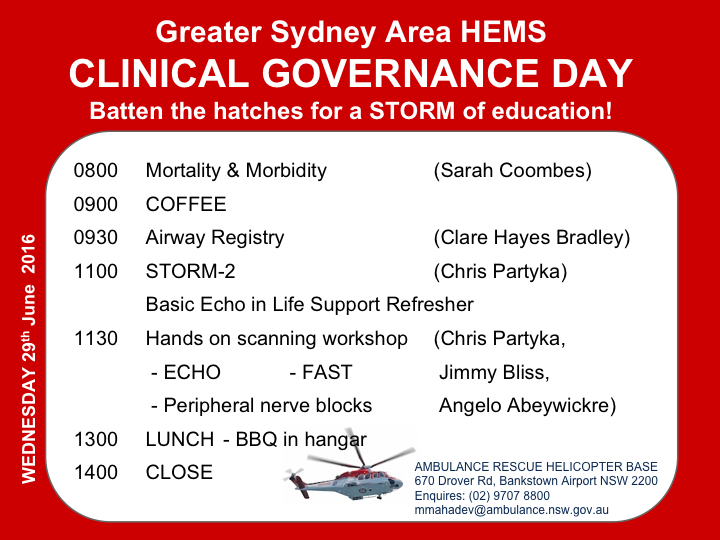 Next week’s CGD begins with a pearl-packed Mortality & Morbidity session and is followed by the always revealing Airway Registry. In the 2nd half of the day, Chris Partyka is returning with part two of the oustanding Sonography Training Oriented to Retrieval Medicine (STORM2) course. This is a fantastic opportunity to hone your ultrasound skills with real-time feedback from the pros and to log some proctored scans to add to your CPD portfolio or just increase your confidence. STORM2 will include a refresher session on Basic Echocardiography in Life Support (BELS) and a 3-station workshop with volunteer patients. If you haven’t previously attended the STORM course, do not fret, you are still encouraged to attend. To get the most out of the session, we suggest that you take a quick look at the following pre-reading with a focus on the echo section of the STORM course manual + the basic echo views. For the enthusiasts, check out the links below as well.